In winter of the late 1990s, my brother, Rob, called me to tell me he found a 1965 Panhead in the boondocks of upstate New York. “What do you mean? Where?” I asked. He wasn’t kidding – the bike was a barn find, surrounded by fresh blankets of snow under an overhang behind a crumpled barn in the Northern Appalachian Mountains. Rob was fixing a phone l i n e behind the barn when he saw the hint of a wheel beneath a tarp. He brushed some snow off the tarp, pulled it off, and couldn’t believe his eyes. We searched for the owner of the bike for weeks. How could someone abandon a 1970’s Chopper and let it rot in the woods? Finally, after relentless calls, we found the guy. Rob negotiated with him. The following weekend, I drove up to the country in a Nor’easter. I had to have this bike. There was no waiting for the snow to melt. This Panhead was in poor shape. I could tell right away that it needed major engine and transmission overhaul. I used it to bomb up and down the streets of my neighborhood for over a year but then one day, I rode it into town, and the engine started smoking and oil spewed out, soaking my jeans as I was sitting at an intersection. I decided to put it away for a while so I threw it in the back corner of my garage and didn’t look at it again for fifteen years. 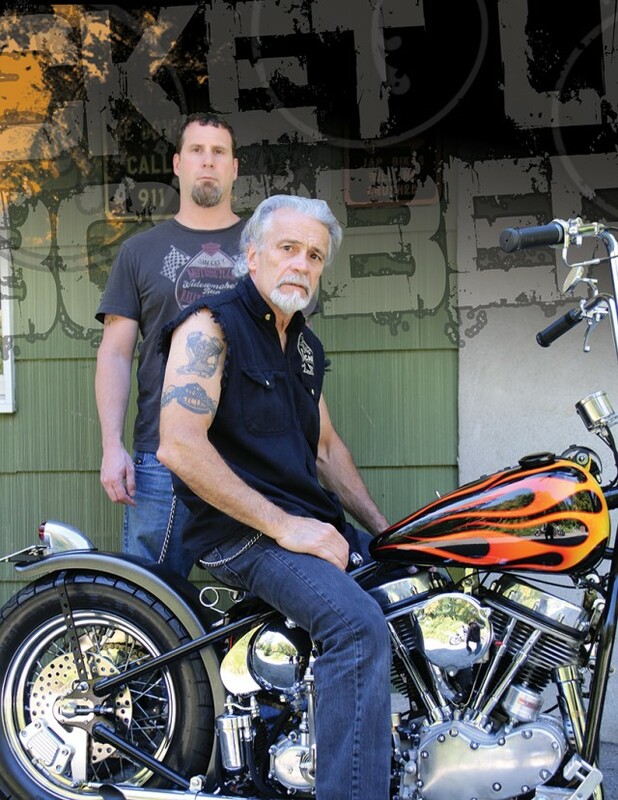 It was my son, Dean, who encouraged me to restore the bike. Dean, my riding buddy for nearly twenty years, knew that this Panhead deserved to be on the road. We agreed that it was time to revive the bike, and so our restoration process began. I went down to my workshop one day and tore the whole bike down to the bare frame; I stood in the middle of the room, staring at nothing but the skeleton. The frame was a cheap aftermarket model, so I bought a Paughco Wishbone Rigid Frame as my starting point. All we salvaged were the engine and transmission. It has always been my dream to build an old-school Bobber, so I followed my long-time ambition; I was psyched to turn this 1970’s Chopper into the Bobber I knew it could be. This was the perfect candidate to fit my taste. It took over three years to resurrect this Pan. I’ve always tinkered with my bikes, but this was a big project; I sought help from talented mechanics in the Hudson Valley. 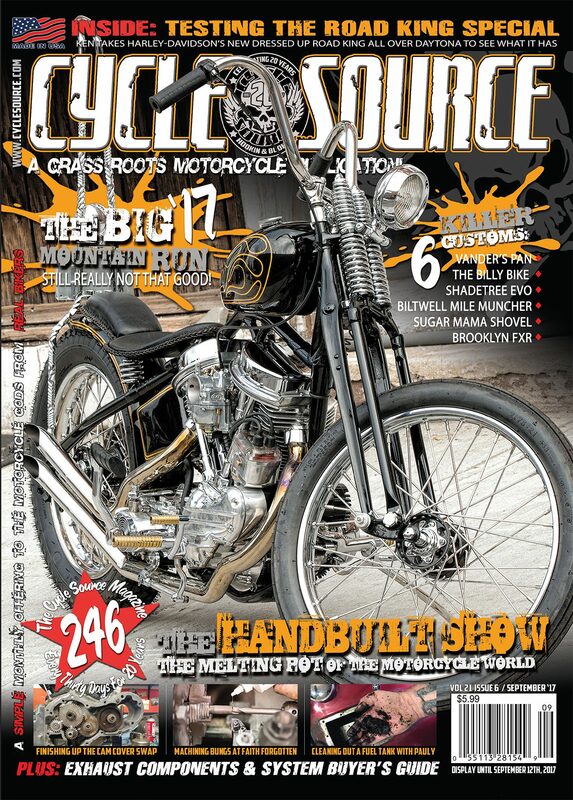 The engine was reconstructed by Mac’s V Twin in Newburgh, New York, and the transmission was rebuilt by Westchester Cycle Works in North Salem, New York. 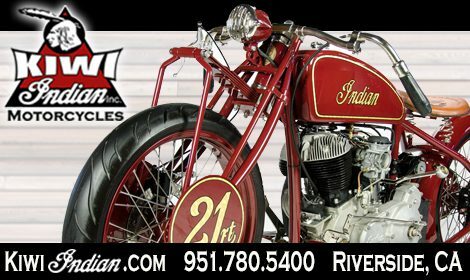 We updated the Pan to new technology, installing electronic ignition, no led conversion, an electronic charging system, and front forks from a 1950’s Panhead. At long last, in the fall of 2014, I took my newly revived Chopper-turned-Bobber for a spin on a crisp, September day. I tore up the hill out of my driveway, and I was filled with memories of my old 1952 Panhead Rigid Chopper. I had forgotten how it feels. My Pan showed no mercy, shuddering, and the raspy voice of its motor blaring up the street. My teeth were chattering so violently I thought my fillings were going to fall out. I had just turned 65, but my Pan treated me like I was back in my twenties, with young bones able to endure its pure and unapologetic energy. I dug the hell out of it. The day I took my first ride, Dean stood at the bottom of my driveway anxiously waiting for his turn. He fell in love with it. It beat the hell out of him, like a wooden rollercoaster that has stood the test of time. This Pan, once lonely and forgotten in my garage, was ready to prove to us, fully rejuvenated, what she’s capable of. It has been a long journey, but I finally have my longdesired Panhead Bobber. She’s like an old friend that I’ve reconnected with. Dean and I have a ball roaring around town on her, weathering raw and choppy rides. I couldn’t have finished this project without the help of Tom Nelson at Westchester Cycle Works in North Salem, New York. 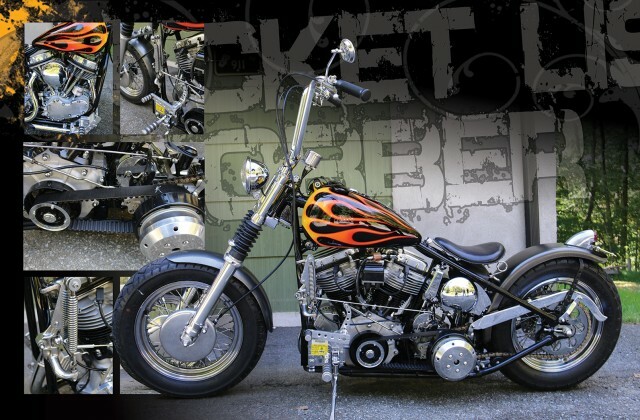 Thank you for helping me achieve my long-awaited vision of an old-school Panhead Bobber. My long history with this Pan makes her revival that much sweeter; I knew when I rescued her from under a barn that she deserved a new life. Dean and I will continue to enjoy this Pan together, proud that our creation has, after a long time, come to life. 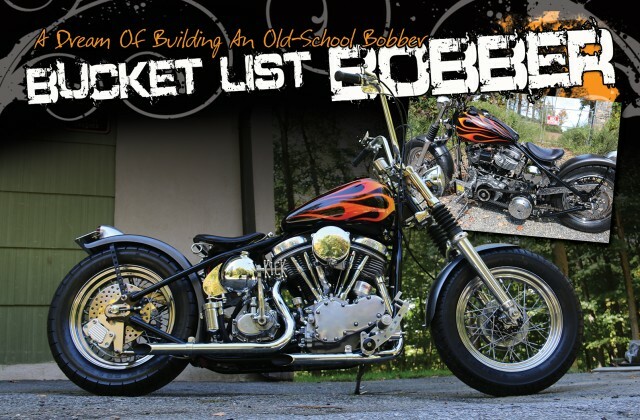 This entry was posted in Feature Bikes and tagged '65 Panhead, Bobber, Drag Specialties, Harley-Davidson, Metzeler, Panhead. Bookmark the permalink.